Will you help us in supporting Terry's vision? Your donation will be matched dollar-for-dollar this holiday season. Thanks to the generosity of a local family foundation, we have just over $5,000 left to raise in our $21,000 holiday match. Donate today! Nearly 1,100 dedicated volunteers care for over 130 affiliate gardens supported by Urban Harvest. Terry Garner is one of them. Terry operates and teaches gardening classes at Palm Center Community Garden. Like others before him, he inspires people throughout Houston to share what they know and what they grow - one person at a time. 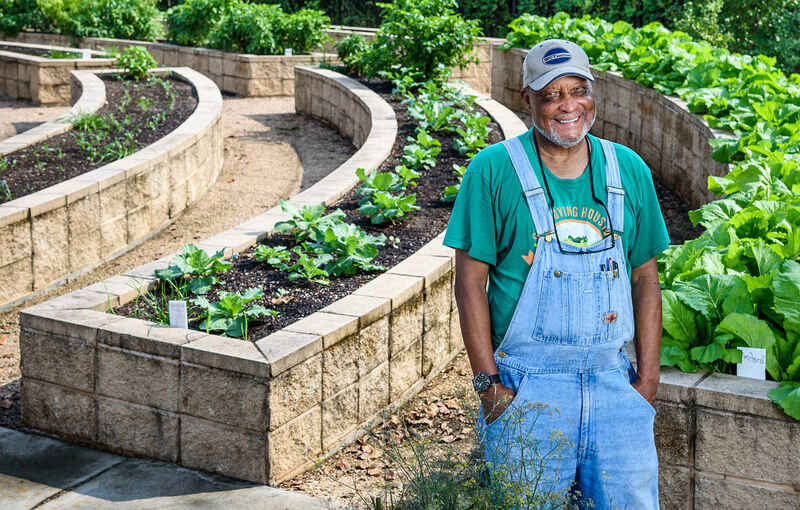 A native of Michigan, Terry learned how to garden from his grandfather during summer vacations to Jasper, Alabama, eventually selling his fresh produce throughout the town to earn some pocket money. Coordinator for the Houston Health Department, creating 12 gardens at multiservice centers throughout Houston. Terry's vision is to get more people involved in community gardens so that gardens will be vibrant and sustainable, cultivating thriving communities for generations to come. Let's start with one garden at a time. Will you join us in supporting Terry's vision? A donation of $375 can support a community garden for one year with seasonal plants, soil amendments, classes, and volunteer support. Great programs. Thanks for doing this.